Please review materials from top to bottom here, but at the end, you’ll get the current updates on our activities and most importantly our Bus Env Survey Present v.9-3-18 which is very telling on our way to developing tech business strength in Hampton Roads. We have lots of stand alone activity like band musicians practicing before a song. Alone they sound like separate instruments, together a masterpiece. A connected, collaborative tech sector network which ties all assets and activity together for successful growth. Convening with a purpose. Tech Sector efforts collaborating to focus on programs that will move the needle and give us success stories to market to the world. What is Foundation for Innovation? 1.A plan to create a regional collaboration model that actually creates synergy, accountability, results and marketing of tech sector efforts. 2.A plan to engage all contributing sources of pertinent information or activity to forward a cohesive effort. 3.A plan to pilot on the Peninsula to create a business case for the balance of Hampton Roads. Organized approach to develop Intellectual Property and Patents. Organized approach to increase Tech Transfer. Organized approach to ramp up Workforce Development to match the market. Organized approach to helping ALL regional tech sector companies (new, existing, clusters). Organized approach to creating success stories for marketing purposes. Creation of collaborative bonding agent to “keep it all connected and cohesive”. 1.We want to establish an High Tech Innovation Corridor up through the Peninsula as a starting point, then expand to include the full region. 2.Create a Peninsula Innovation Advisory Committee (the hands-on Team). This is for the pilot program. When it goes regional, we’ll add south side Advisory Committee. 3.Inventory the assets of the Peninsula. This is for the pilot program and we’ll do the same thing for the south side when it’s full regional. 4.Create the true connected ecosystem and begin communicating our message to the base of assets we have, asking them to be a part. The whole program is intended to grow our tech sector and create jobs. We want ALL tech companies on-board: start-ups, mid level, large. Existing incubators, new accelerators, members such as VT, ODU, NASA, JLab, NIA, Navy, Army, Air Force (Langley) 757 Angels, ReInvent HR, VMASC VA Center for Innovative Technology, and others TBD. 5.Meet with the assets/members on a periodic basis to ask them what’s working, what improvements are needed. 6.Create Boot Camps to fill the gaps between academia and real world needs. Feed that knowledge back into the schools to continue raising the bar. 7.Create a Hub of IP, R&D, Product Development and Commercialization. Begin to sponsor New Product Visioning and Development efforts. Leverage the Engineering Schools in our Region, this should be a series of Concept to Commercial program developed by HRIC. Regional assistance in exchange for regional basis of IP and export. 8.Support identified clusters within the Foundation for Innovation framework, but look for others that could leverage the assets in Hampton Roads. High Speed Next Generation Internet an absolute requirement to support. 9.Begin the marketing (for attraction purposes). Tell the story of Foundation for Innovation, describing the business environment for success that companies can leverage. National campaign via social media and other new methods. 10.Monitor, refine toward continuous improvement. 11.Help to expand around the region by replicating this on the south side. READ THE REPORT which resulted from over 20 interviews with tech companies in the region. READ THE REPORT which explains the common themes uncovered. READ THE REPORT which has suggestions on how to move forward. READ THE REPORT but come back here from time to time to see how we’re progressing on our efforts. 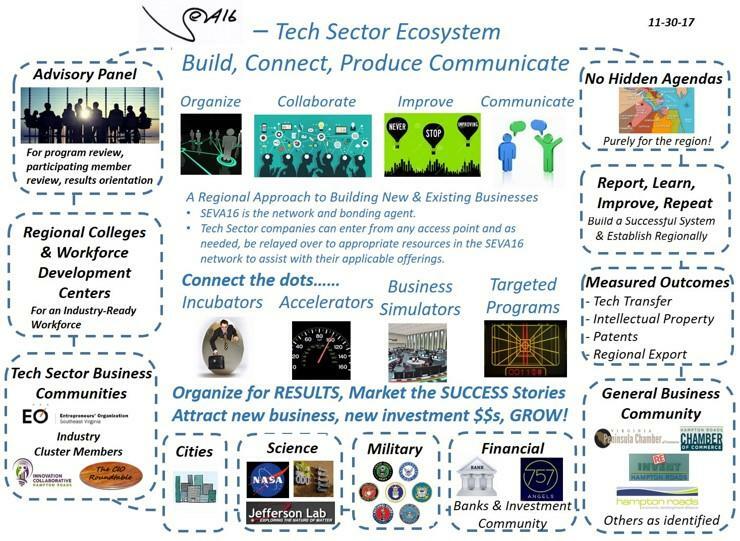 Hampton Roads Regional Technology Ecosystem Member Visual: Ecosystem 10-2-18. Our region has some tremendous resources for business and innovation. The challenge is to make sure people know about them. These listings are not all-inclusive but it’s a start. If you see something missing, just let us know and we’ll add it. Also check with your local city Economic Development Department. They have access to and provide great resources as well. What’s missing from our Ecosystem? Do we have a mindset for GROWTH? Take a look at our HRIC Programs, many of which of elements of Accelerator activity.